Akkulift Replacement Battery - 400351 Free Shipping! This is the replacement battery for the Akkulift bath lift. The battery is about the size of a brick, and slides into the back of the back rest. This is a Drive Medical product, however it is also known as the 400351 Endres battery. 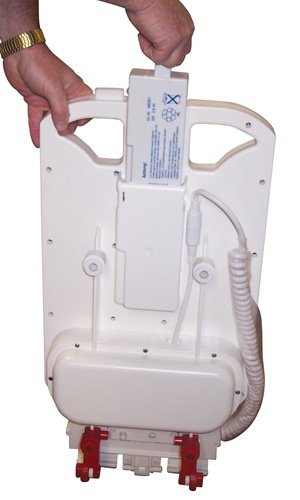 We have been struggling to find a company who could provide parts for our disabled daughters bath chair- we originally ordered the charger, but realized it as the battery that was bad. Mark was great at keeping us informed and getting us the product we needed- I would highly recommend this business with no reservations to anyone who needs these products- We will absolutely be using them again! Thanks so much!!! I was happy to have found this Akkulift battery for a bath lift that has not been used in a long time. The battery was promptly delivered and brought the Akkulift back to life! After 6 years my original battery is starting to die, I tried to purchase a replacement battery from a company in the UK but they could not ship a battery to the USA. I am so glad I found you online so that I can continue using the bath lift for years to come. Was so glad to be able to find this battery. It shipped promptly and works well. Should keep the bath lift going for a few more years. Took a chance on buying this battery for an older Akkulift that was not working, and sure enough it did the trick! Should get a few more years out of this lift thanks to the new battery.